Senator Rosana Tositrakul serves Thai society through her sincerity, bravery and excellent example for Thai women. She notes that practicing Buddhism is not only about philosophy or doing meditation; it is also the acts of compassion, courage and understanding that people undertake to alleviate human suffering. Rosana develops her heart by working with the community. 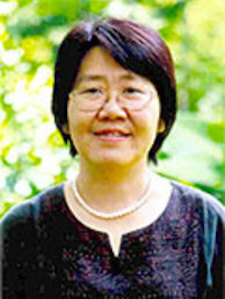 Particularly, she has encouraged Thai people to take care of their health and use self-reliant herbal remedies. Her support of peoples’ movements and counter-corruption has empowered many and clarified numerous political issues. Amidst political turmoil, she has helped to steady a nation. Her translation of Buddhist Dhamma books (a book a year) enriches the lives of Thai people. Senator Rosana Tositrakul is elevating the role and status of Thai women by calling into question the predominant views of Thai men towards women, even in the Parliament.